A wedding anniversary is a time to reflect on the journey you have faced as a couple as well as where the journey will lead. Many couples choose to celebrate a special or monumental wedding anniversary with fine jewelry. We design and manufacture a wide variety of jewelry, including anniversary rings that are suitable to celebrate any milestone year. These ring designs can be added worn instead of an engagement ring, added to a bridal set, or worn as a right hand ring. To learn more about each of the rings, you may click on the image or on the link below. An eternity ring represents your eternal and never-ending love, making it an ideal gift for a wedding anniversary. The ring uses exclusively F-G color VS clarity carré cut diamonds, which will weigh approximately 2.00 cttw. The ring has a width of 3.2mm and can be worn alone or stacked next to additional rings. 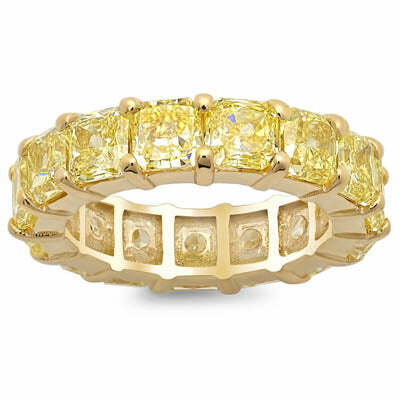 A sparkling, yellow diamond eternity band is as luxurious as it comes. This ring is set with an impressive 8.00 cttw of fancy yellow radiant cut diamonds. We use an 18 karat yellow gold shared prong setting to enhance the color of the yellow diamonds. Our collection of rose gold morganite rings is a wonderful choice for a right hand ring or cocktail ring. 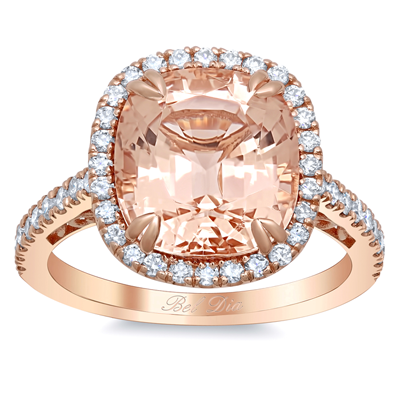 You may choose between a 2.50 carat (9x9mm) and a 5.25 (10.5×11.5mm) cushion cut morganite. This ring is lovely to wear as an engagement ring upgrade or as a right hand ring.